This is a rustic themed wedding guest book I made for a friend. I purchased a simple white wedding guest book the kind that is padded. I tore it apart so that the cardboard cover and patting were showing. I covered the front and back with a napkin that I purchased from Target, I sponged on Aleen's tacky glue to adhere it. 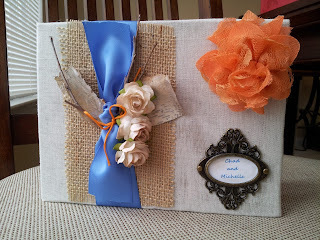 I adhered a piece of burlap with Mod Podge, added cornflower blue satin ribbon and tied it around the cover. Then I picked some bark off a birch tree along with some twigs and glued them on using Aleen's glue and some E6000, added some wild orchid crafts roses, tied a tangerine colored thread around the ribbon, added a Joleen's material flower in the corner, printed the names and covered it with a Tim Holtz ornate plate. I love how it turned out and hope you do too!